The ever-changing legal and regulatory framework applicable to airports continued to evolve in 2014. A number of key cases, FAA publications, and third-party articles and reports were published throughout the calendar year that contributed to and amended the growing body of airport law. 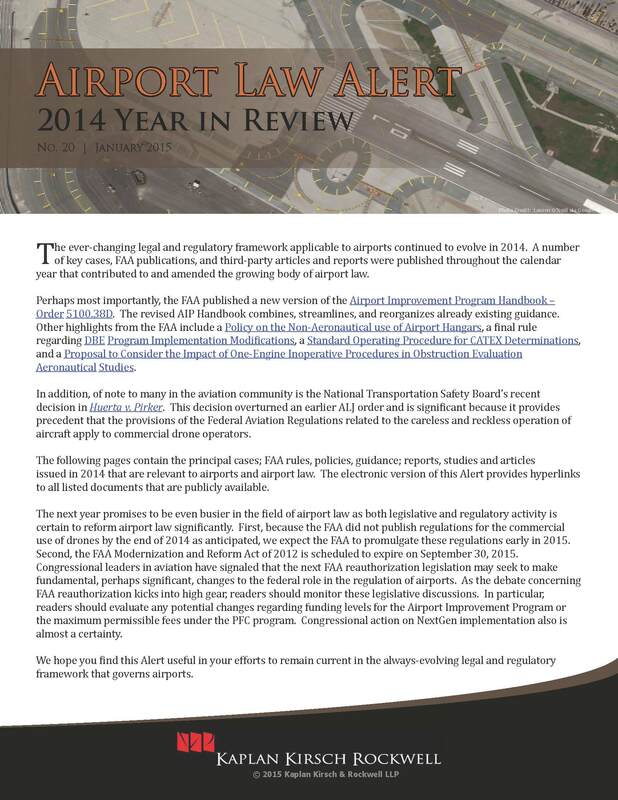 Perhaps most importantly, the FAA published a new version of the Airport Improvement Program Handbook – Order 5100.38D. The revised AIP Handbook combines, streamlines, and reorganizes already existing guidance. Other highlights from the FAA include a Policy on the Non-Aeronautical use of Airport Hangars, a final rule regarding DBE Program Implementation Modifications, a Standard Operating Procedure for CATEX Determinations, and a Proposal to Consider the Impact of One-Engine Inoperative Procedures in Obstruction Evaluation Aeronautical Studies. In addition, of note to many in the aviation community is the National Transportation Safety Board’s recent decision in Huerta v. Pirker. This decision overturned an earlier ALJ order and is significant because it provides precedent that the provisions of the Federal Aviation Regulations related to the careless and reckless operation of aircraft apply to commercial drone operators. The content below contains the principal cases; FAA rules, policies, guidance; reports, studies and articles issued in 2014 that are relevant to airports and airport law. The electronic version of this Alert provides hyperlinks to all listed documents that are publicly available. The next year promises to be even busier in the field of airport law as both legislative and regulatory activity is certain to reform airport law significantly. First, because the FAA did not publish regulations for the commercial use of drones by the end of 2014 as anticipated, we expect the FAA to promulgate these regulations early in 2015. Second, the FAA Modernization and Reform Act of 2012 is scheduled to expire on September 30, 2015. Congressional leaders in aviation have signaled that the next FAA reauthorization legislation may seek to make fundamental, perhaps significant, changes to the federal role in the regulation of airports. As the debate concerning FAA reauthorization kicks into high gear, readers should monitor these legislative discussions. In particular, readers should evaluate any potential changes regarding funding levels for the Airport Improvement Program or the maximum permissible fees under the PFC program. Congressional action on NextGen implementation also is almost a certainty. We hope you find this Alert useful in your efforts to remain current in the always-evolving legal and regulatory framework that governs airports. Air Traffic Control. Abbey v. United States, 745 F.3d 1363 (Fed. Cir. 2014) (denying Air Traffic Controller’s request for a rehearing en banc regarding the decision by the U.S. Court of Appeals to vacate the U.S. Court of Federal Claims’ $50 million judgment for nearly 8,000 FAA air traffic controllers who challenged the FAA’s personnel reform authority). ATSA. Air Wisconsin Airlines Corp. v. Hoeper, 134 S. Ct. 852 (2014) (holding that Air Wisconsin had immunity under ATSA for true statements made to TSA regarding a pilot that the airline believed was potentially a threat). Administrative Review. Alliance for Safe, Efficient and Competitive Truck Transportation v. FMCSA, No. 12-1305 (D.C. Jun. 17, 2014) (accepting the notion that an informal presentation, such as a PowerPoint presentation, by an administrative agency could trigger new rulemaking obligations if it announces new rules or differs materially from the formally promulgated rule). Airport Sponsorship. City of Charlotte v. North Carolina, No. 13-CRS-12678 (N.C. Sup. Ct. Oct. 13, 2014) (holding that a state statute was preempted by federal aviation law where it directed a local airport commission to operate an airport before receiving an FAA operating certificate). Surplus Property Act. City of Santa Monica v. United States, No. 13-8046 (C.D. Cal. Feb. 13, 2014) (explaining that City’s quiet title action regarding the property underlying the Santa Monica Airport was barred by the statute of limitations), appeal docketed, No. 14-55583 (Cal. Ct. App. Apr. 11, 2014). Fourth Amendment. Corbett v. TSA, 767 F.3d 1171 (11th Cir. 2014) (concluding that the challenged TSA airport screening procedures do not violate the Fourth Amendment). Runways. Eastern Queens Alliance, Inc. v. FAA, No. 14-1612-ag (2d Cir. Dec. 23, 2014) (dismissing the petition for review because the grounds for the challenge had not been raised during the public comment period associated with the Environmental Assessment). FOIA. Elkins v. FAA, 2014 U.S. Dist. LEXIS 119858 (D.D.C. Aug. 28, 2014); but see Elkins v. FAA (M.D. Fla. 12-2009) (reaching opposite rulings on FAA’s motion for summary judgment in two related FOIA cases regarding several requests for radar data, and air traffic control communications). Airspace. Fleitman v. FAA, No. 13-1984 (1st Cir. Dec. 19, 2014) (denying petitioner’s challenge to FAA’s Finding of No Significant Impact/Record of Decision implementing a new air traffic control Area Navigation (RNAV) standard instrument departure from Runway 33L at Boston Logan International Airport). First Amendment. International Society for Krishna Consciousness of California, Inc. v. City of Los Angeles, 2014 WL 4086794 (9th Cir. Aug. 20, 2014) (upholding the Los Angeles International Airport’s ban on the continuous or repetitive solicitation of funds in airport terminals, parking lots, and sidewalks). Antitrust. JetAway Aviation LLC v. Board of County Commissioners, Nos. 12-1173 & 12-1194 (10th Cir. Jun. 9, 2014) (affirming the district court’s grant of summary judgment in favor of defendants on the basis that JetAway did not have antitrust standing to bring its claims). Environmental Assessment. Louie v. Huerta, Nos. 13-1285 & 13-1286 (D.C. Cir. Dec. 23, 2013) (dismissing the petition after FAA agreed to prepare, at a minimum, an environmental assessment in regard to airport’s request for a Part 139 certificate). Tort Liability. McKenzie v. Truckee Tahoe Airport District, 2014 U.S. Dist. LEXIS 143457 (E.D. Cal. Oct. 7, 2014) (explaining that the airport was not vicariously liable for an injury arising from an alleged "dangerous condition" because state law precluded application of the rule of vicarious liability to public entities for employee negligence in cases of dangerous conditions). Jurisdiction. Pucciariello v. United States, 116 Fed. Cl. 390 (2014) (holding that the court lacked jurisdiction to consider the Plaintiff’s breach of claim and his Fifth Amendment takings claims because those claims were subject to the exclusive jurisdictional scheme set forth in 49 U.S.C.S. § 46110 and the time to proceed under § 46110 had already passed). Administrative Review. SecurityPoint Holdings, Inc. v. TSA, No. 13-1068 (D.C. Oct. 28, 2014) (holding that an informal letter from TSA is a reviewable order, and that because the decision contained in the letter "failed to consider an important aspect of the problem," it must be set aside as arbitrary and capricious). Part 77. Town of Barnstable v. FAA, 740 F.3d 681 (D.C. Cir. 2014) (rejecting petitioner’s challenge to the construction of 100 wind turbines in Nantucket Sound on the grounds that FAA had failed to properly analyze the adverse effects of the wind turbine as required by regulation); see also Town of Barnstable v. FAA, 659 F.3d 28 (D.C. Cir. 2011) (concluding that the FAA’s no hazard determinations were arbitrary and capricious because they departed from the agency’s own internal guidelines). Flytenow v. FAA, No. 14-1168 (D.C. Cir. filed October 7, 2014) (challenging FAA’s conclusion that pilots participating in peer-to-peer flight sharing are obligated to hold a Part 119 certificate). Lyons v. FAA, No. 14-72991 (9th. Cir. filed Sept. 26, 2014) (challenging FAA’s Final Environmental Assessment and Finding of No Significant Impact/Record of Decision for the Northern California Optimization of Airspace and Procedures in the Metroplex). City of Mukilteo v. USDOT, No. 13-70385 (9th. Cir. Aug. 1, 2014) (staying consideration of the petition for review of the Finding of No Significant Impact, and Record of Decision until December 18, 2015, regarding amendment to the Paine Field operations specifications and FAR Part 139 operating certificate to allow commercial service). East Valley Water District v. San Bernardino International Airport Authority, No. 14-00138 (C.D. Cal. filed Jul. 15, 2014) (appealing a dismissal by the U.S. District Court for the Central District of California of a quiet title action against San Bernardino International Airport and the United States). DHS v. MacLean, 714 F.3d 1301 (Fed. Cir. 2013), cert. granted, 82 U.S.L.W. 3470 (U.S. May 19, 2014) (No. 13-894) (reviewing whether a federal air marshal is protected by 5 U.S.C. § 2308(b) (8)(A) after disclosing sensitive security information without authorization). BRRAM, Inc. v. FAA, No. 14-02686 (D.N.J. filed Apr. 28, 2014) (challenging the issuance of an operations specification amendment to Frontier Airlines and alleging violations of NEPA and the APA). Barnes v. FAA, No. 14-71180 (9th. Cir. filed Apr. 21, 2014) (Petition for Review of FAA’s Final Supplemental Environmental Assessment, Finding of No Significant Impact, and Record of Decision regarding a new parallel runway project at Hillsboro Airport). Tulsa Airports Improvement Trust v. United States, No. 13-906 (Fed. Cl. filed Feb. 21, 2014) (FAA has filed a motion to dismiss Plaintiff’s First Amended Complaint contending that payments made to subcontractors are eligible costs under the AIP program). National Federation of the Blind v. USDOT, No. 14-00085 (D.D.C filed Jan. 22, 2014) (challenging DOT’s final rule regarding the accessibility of airport automated kiosks). City of Ontario v. City of Los Angeles, No. RIC1306498 (Cal. Sup. Ct. filed Jun. 3, 2013) (considering whether the City of Los Angeles should return ownership, operation, and control of the Ontario International Airport to the City of Ontario). Final Decision, California High Speed Rail Authority – Petition for Declaratory Order, Surface Transportation Board Docket No. FD 35861 (Dec. 12, 2014) (concluding that the California Environmental Quality Act, Cal. Pub. Res. Code § 21000, et seq., as it applies to the 114-mile high-speed passenger rail line between Fresno and Bakersfield, California is preempted in its entirety by the Interstate Commerce Commission Termination Act, Pub. L. 104–88, 104th Congress). Huerta v. Pirker, NTSB Docket No. CP-217 (Nov. 18, 2014) (concluding that unmanned aircraft systems (UAS) meet the legal definition of "aircraft," and that the FAA may take enforcement action against anyone who operates a UAS or model aircraft in a careless or reckless manner); rev’g, NTSB Docket No. CP-217 (Mar. 6. 2014) (finding that FAA has no enforcement authority to fine Respondent because there was no enforceable FAA rule regarding model aircraft at the time of the flight). Final Decision, FAA Determination Pursuant to Part 161 – LAWA Application dated January 13, 2013 (supplemented May 14, 2014) (Nov. 7, 2014) (denying LAWA’s proposal under FAR Part 161 to limit aircraft departures to the east between 12:00 midnight and 6:30 a.m. when the airport is in over-ocean or westerly operations at Los Angeles International Airport). Director’s Determination, Meyer v. City of Cincinnati, FAA Docket No. 16-12-14 (Sept. 12, 2014) (concluding that the City of Cincinnati is not in violation of Grant Assurance 25 regarding airport revenue, nor did it violate 49 U.S.C. § 47133 when it closed its Blue Ash Airport). Director’s Determination, De Vries v. City of St. Clair, FAA Docket No. 16-12-07 (May 20, 2014) (finding that the City of St. Clair is in compliance with its grant assurance obligations as they relate to negotiations for an aircraft hangar lease). Correction, Safety Management Systems for Domestic, Flag, and Supplemental Operations Certificate Holders, 80 Fed. Reg. 1,584 (Jan. 13, 2015). Letter, Law Enforcement Guidance for Suspected Unauthorized UAS Operations (Jan. 8, 2015). Final Rule, Safety Management Systems for Domestic, Flag, and Supplemental Operations Certificate Holders, 80 Fed. Reg. 1,308 (Jan. 8, 2015). Notice of Proposed Rulemaking, Slot Management and Transparency for LaGuardia Airport, John F. Kennedy International Airport, and Newark Liberty International Airport, 80 Fed. Reg. 1,274 (Jan. 8, 2015). Notice, Notice of Final Decision on Proposed Airport Access Restriction, 79 Fed. Reg. 70,267 (Nov. 25, 2014). Draft Advisory Circular No. 150/5200-28E, Notices to Airmen (NOTAMs) for Airport Operators (Nov. 7, 2014). Final Policy Amendment, Policy and Procedures Concerning the Use of Airport Revenue; Proceeds From Taxes on Aviation Fuel, 79 Fed. Reg. 66,282 (Nov. 7, 2014). Memorandum, Proposed Commercial Space Facilities and Operations at Federally Obligated or Part 139 Airports (Oct. 20, 2014). Advisory Circular No. 150/5380-7B, Airport Pavement Management Program (Oct. 10, 2014). Advisory Circular No. 150/5380-6C, Guidelines and Procedures for Maintenance of Airport Pavements (Oct. 10, 2014). Final Rule, Disadvantaged Business Enterprise: Program Implementation Modifications, 79 Fed. Reg. 59,565 (Oct. 2, 2014). Airport Standard Operating Procedure 5.0, CATEX Determinations (Oct. 1, 2014). Advisory Circular No. 150/5100-14E, Architectural, Engineering, and Planning Consultant Services for Airport Grant Projects (Sept. 30, 2014). Order 5100.38D, Airport Improvement Program Handbook (Sept. 30, 2014). Advisory Circular No. 150/5220-20A, Airport Snow and Ice Control Equipment (Sept. 24, 2014). Notice and Request for Public Comment, Advisory Circular for Aviation Safety Action Program (ASAP), 79 Fed. Reg. 53,008 (Sept. 5, 2014). Airport Standard Operating Procedure 4.0, Safety Risk Management (SRM) Under the FAA Office of Airports Safety Management System (SMS) (Sept. 1, 2014). Notice and Request for Public Comment, Implementation of Legislative Categorical Exclusion for Environmental Review of Performance Based Navigation Procedures, 79 Fed. Reg. 49,141 (Aug. 19, 2014). Advisory Circular No. 150/5335-5C, Standardized Method of Reporting Airport Pavement Strength – PCN (Aug. 14, 2014). Letter, Federal Aviation Administration Assistant Chief Counsel for International Laws re: Peer-to-Peer Aviation Flight Sharing Company (Aug. 13, 2014). Final Rule, Orders of Compliance, Cease and Desist Orders, Orders of Denial, and Other Orders, 79 Fed. Reg. 46,964 (Aug. 12, 2014). Proposed Rule, Policy on the Non-Aeronautical Use of Airport Hangars, 79 Fed. Reg. 42,483 (Jul. 22, 2014). Advisory Circular No. 150/5370-10G, Standards for Specifying Construction of Airports (Jul. 21, 2014). Memorandum, Operation of UAS as Public Aircraft for Educational Purposes (Jul. 3, 2014). Notice - Request for Comment, Notice of Proposed Airport Access Restriction and Opportunity for Public Comment, 79 Fed. Reg. 36,577 (Jun. 27, 2014). Final Rule, The Extension of the Expiration Date of the New York North Shore Helicopter Route, 79 Fed. Reg. 35,488 (Jun. 23, 2014). Advisory Circular No. 150/5340-26C, Maintenance of Airport Visual Aid Facilities (Jun. 20, 2014). Draft Advisory Circular No. 150/5345-10H, Specification for Constant Current Regulators and Regulator Monitors (May 6, 2014). Notice of Proposed Policy, Proposal To Consider the Impact of One Engine Inoperative Procedures in Obstruction Evaluation Aeronautical Studies, 79 Fed. Reg. 23,300 (Apr. 28, 2014). Notice, Airport Improvement Program (AIP) Grant Assurances, 79 Fed. Reg. 18,755 (Apr. 3, 2014). Notice, MAP–21 Section 1306 Financial Penalties Guidance, 79 Fed. Reg. 18,113 (Mar. 31, 2014). Notice of Extension to Order, Operating Limitations At New York LaGuardia Airport, 79 Fed. Reg. 17,222 (Mar. 27, 2014); Operating Limitations At Newark Liberty International Airport, 79 Fed. Reg. 16,857 (Mar. 26, 2014); Operating Limitations At John F. Kennedy International Airport, 79 Fed. Reg. 16,854 (Mar. 26, 2014). Advisory Circulars, Current FAA Advisory Circulars Required for Use in AIP Funded and PFC Approved Projects (Mar. 20, 2014). Draft Guidance: Consideration of Climate Change in Federal Environmental Reviews (Dec. 18, 2014). Proposed Rule, Carbon Pollution Emission Guidelines for Existing Stationary Sources: Electric Utility Generating Units, 79 Fed. Reg. 34,830 (Jun. 18, 2014). Proposed Rule, Definition of ‘‘Waters of the United States’’ Under the Clean Water Act, 79 Fed. Reg. 22,188 (Apr. 21, 2014). Proposed Rule, Listing Endangered and Threatened Species and Designating Critical Habitat; Implementing Changes to the Regulations for Designating Critical Habitat, 79 Fed. Reg. 27,066 (May 12, 2014). Proposed Rule, Interagency Cooperation—Endangered Species Act of 1973, as Amended; Definition of Destruction or Adverse Modification of Critical Habitat, 79 Fed. Reg. 27,060 (May 12, 2014). Policy, Implementation of Section 4(b)(2) of the Endangered Species Act, 79 Fed. Reg. 27,051 (May 12, 2014). Federal Aviation Administration, Competition Plan Covered Airports, 2015 Approval Dates and Competition Plans Required Based Upon 2013 Enplanement Data (Nov. 2014). Office of the Inspector General, Planning for High-Priority NextGen Capabilities Underway, But Much Work Remains for Full Realization of Benefits (Nov. 2014). Office of the Inspector General, Management Limitations May Hinder FAA’s Ability To Fully Implement and Assess the Effectiveness of Its Runway Safety Initiatives (Sept. 2014). Office of the Inspector General, ADS-B Benefits Are Limited Due to a Lack of Advanced Capabilities and Delays in User Equipage (Sept. 2014). Federal Aviation Administration, Airport Capacity Profiles (Jul. 2014) (providing a high level assessment of present and future airport runway capacity). Office of the Inspector General, FAA Faces Significant Barriers To Safely Integrate Unmanned Aircraft Systems Into the National Airspace System (Jun. 2014). Office of the Inspector General, FAA Faces Significant Obstacles in Advancing the Implementation and Use of Performance Based Navigation Procedures (Jun. 2014). Office of the Inspector General, Reductions in Competition Increase Airline Flight Delays and Cancellations (Apr. 2014). Federal Aviation Administration, Asset 2: In-Depth Review of the 497 Unclassified Airports (Mar. 2014) (reviewing the 497 airports not categorized in FAA’s original ASSET report, published in 2012). Office of the Inspector General, Addressing Underlying Causes for NextGen Delays Will Require Sustained FAA Leadership and Action (Feb. 2014). Aviation Security: Rapid Growth in Expedited Passenger Screening Highlights Need to Plan Effective Security Assessments, GAO-15-150 (Dec. 12, 2014). Airport Privatization: Airport Privatization - Limited Interest despite FAA’s Pilot Program, GAO-15-42 (Nov. 19, 2014). Air Traffic Control Systems: Selected Stakeholders’ Perspectives on Operations, Modernization, and Structure, GAO-14-770 (Sep. 12, 2014). Aviation Safety: Additional Oversight Planning by FAA Could Enhance Safety Risk Management, GAO-14-516 (Jun. 25, 2014). Airport Funding: Aviation Industry Changes Affect Airport Development Costs and Financing, GAO-14-658T (Jun. 18, 2014). Commercial Aviation: Status of Air Service to Small Communities and the Federal Programs Involved, GAO-14-454T (Apr. 30, 2014). Advanced Imaging Technology: TSA Needs Additional Information before Procuring Next-Generation Systems, GAO-14-357 (Mar. 31, 2014). Aviation Workforce: Current and Future Availability of Airline Pilots, GAO-14-232 (Feb. 28, 2014). Legal Research Digest 22: The Role of the Airport Sponsor in Airport Planning and Environmental Reviews of Proposed Development Projects Under the National Environmental Policy Act (NEPA) and State Mini-NEPA Laws (Apr. 2014). Report 120: Airport Capital Improvements: A Business Planning and Decision-Making Approach (Nov. 2014). Report 119: Prototype Airport Sustainability Rating System—Characteristics, Viability, and Implementation Options (Dec. 2014). Report 117: Airport Escalators and Moving Walkways—Cost-Savings and Energy Reduction Technologies (Nov. 2014). Report 116: Guidebook for Successfully Assessing and Managing Risks for Airport Capital and Maintenance Projects (Oct. 2014). Report 114: Guidebook for Through-the-Fence Operations (Sept. 2014). Report 113: Guidebook on General Aviation Facility Planning (Sept. 2014). Report 112: Airport Terminal Incident Response Planning (Aug. 2014). Report 111: A Guidebook for Airport-Airline Consortiums (Aug. 2014). Report 108: Guidebook for Energy Technologies Compatibility with Airports and Airspace (Apr. 2014). Report 107: Development of a Runway Veer-Off Location Distribution Risk Assessment Model and Reporting Template (Apr. 2014). Report 106: Being Prepared for IROPS: A Business-Planning and Decision-Making Approach (Mar. 2014). Report 105: Guidelines for Ensuring Longevity in Airport Sound Insulation Programs (Feb. 2014). Report 104: Defining and Measuring Aircraft Delay and Airport Capacity Thresholds (Mar. 2014). Synthesis 58: Safety Reporting Systems at Airports (Jul. 2014). Synthesis 57: Airport Response to Special Events (Jul. 2014). Synthesis 54: Electric Vehicle Charging Stations at Airport Parking Facilities (May 2014). Synthesis 53: Outcomes of Green Initiatives: Large Airport Experience (May 2014). Synthesis 51: Impacts of Aging Travelers on Airports (May 2014). Synthesis 50: Effective Cooperation Among Airports and Local and Regional Emergency Management Agencies for Disaster Preparedness and Response (Mar. 2014). R. Tang, Airport Privatization: Issues and Options for Congress, Congressional Research Service, R43545 (May 12, 2014). Airports Council International – North America, Recommendations of ACI-NA Multi-Committee Task Force On Ride-Booking Operations at Airports (Sept. 22, 2014). Airports Council International – North America, Airport Carbon Accreditation Program (Sept. 2014). J. Hodge, General Aviation Security: Risk, Perception, and Reality, 26 Air & Space Lawyer, No. 4 (2014) [subscription required]. C. Whitlock, FAA drone approvals bedeviled by warnings, conflict, internal e-mails show, Washington Post (Dec. 21, 2014). A. Levin, Pilot Close Calls With Drones Grow Rapidly, FAA Reports, Bloomberg (Nov. 26, 2014). J. Nicas & A. Pasztor, Drone Flights Face FAA Hit, Wall Street Journal (Nov. 24, 2014) [subscription required]. Federal Aviation Administration, Press Release - U.S. Transportation Secretary Foxx Announces FAA Exemptions for Commercial UAS Movie and TV Production (Sept. 25, 2014). E. Tazwell Elliot & W. Elder, Huerta v. Pirker: FAA’s Regulation of Innovative Technology on Trial, 27 Air & Space Lawyer, No. 2 (2014) [subscription required]. M. Warren, UAS Integration: A Call to Action, 27 Air & Space Lawyer, No. 2 (2014) [subscription required]. A PDF of this Airport Law Alert is available.